Mediterranean Beach Hotel, a four-star hotel is ideal for couples and families looking for an all-inclusive and half-board accommodation on Santorini Island. The hotel features a long private beach that is fitted with sun loungers and parasols. There’s also a massive outdoor swimming pool within the hotel complex that is also fitted with sun loungers and parasols. The onsite restaurant serves both local and international cuisines. The hotel’s spa offers a plethora of massages and therapies. The guestrooms are spacious, airy and comfortable. They come with all the necessary amenities required by the modern traveller. Located only 3.2km from Santorini Airport, the Mediterranean Beach Hotel is a modern hotel that houses 70 guestrooms. Built right next to the beach of Kamari, the views from the hotel are remarkable. There are scores of restaurants, cafes, bars and shops around the hotel—water sports activities are also held within stone’s throw from the complex. Fira Town (7.8km) and Santorini Port (12.1km) are beautiful places you can visit as a day time activity. 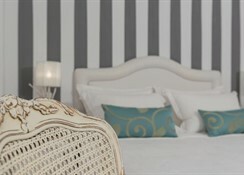 Accommodations in Mediterranean Beach Hotel are divided into standard rooms and suites. Designed to offer comfort and luxury to guests, features such as the air conditioning, TV with satellite, en suite with bath amenities, hairdryer, telephone, mini bar and safe deposit are common across the rooms. Bedding options depend on availability, but you can select between twin beds and double bed. Each room can host three adults or two adults and two kids—extra bed and crib are provided upon request. The mini bar is refilled three times a week, but room cleaning is an everyday service. And from the balcony, you can view the garden, sea, mountain range, depending on the location. The hotel features a restaurant that serves breakfast and dinner in buffet style. 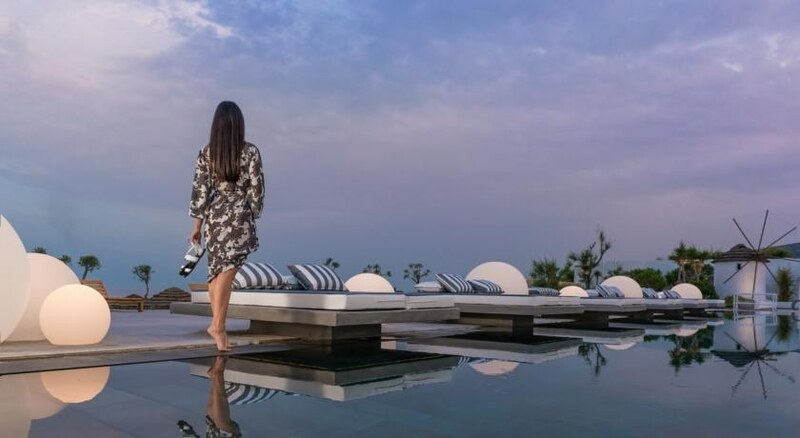 On the spread are selected local and international cuisines deliciously prepared by the chefs—for dinner, you can also choose to visit the speciality a la carte restaurant. A wide selection of alcoholic and non-alcoholic beverages is served in the buffet restaurant. The pool bar serves snacks and light bites for lunch, and also cocktails, mocktails and other beverages from morning till sunset. A lively destination after dinner is the main bar where you can catch up with friends or have a great time with your family—it serves a wide range of alcoholic drinks. There is a large outdoor swimming pool that comes fitted with loungers and parasols—there is a kid’s paddle pool in the adjoining. You can visit the swanky fitness centre anytime throughout the day, as well as the wellness centre—you can get massages and treatments even around the swimming pool. Out on the beach, you’ll find activities such as canoeing, diving, snorkelling, wind surfing, boating and more. But if you aren’t a water sports enthusiast horse riding range and tennis courts are available in the neighbourhood.